Friends! How is the New Year treating you so far? Good I hope. Have you made any resolutions yet? Any luck at keeping them? I love this post by Zen Habits for inspiration on goal setting. Do share your ambitions in the comments – we’d love to know! We’ve been enjoying our new digs in Portland, have met a few new friends, tried new restaurants, and have been enjoying a few chilly, winter walks. 2015 has been treating us well thus far. As far as cooking, we’ve been reaching for lighter things lately. After all that holiday goodness we’ve been craving all things light and fresh. 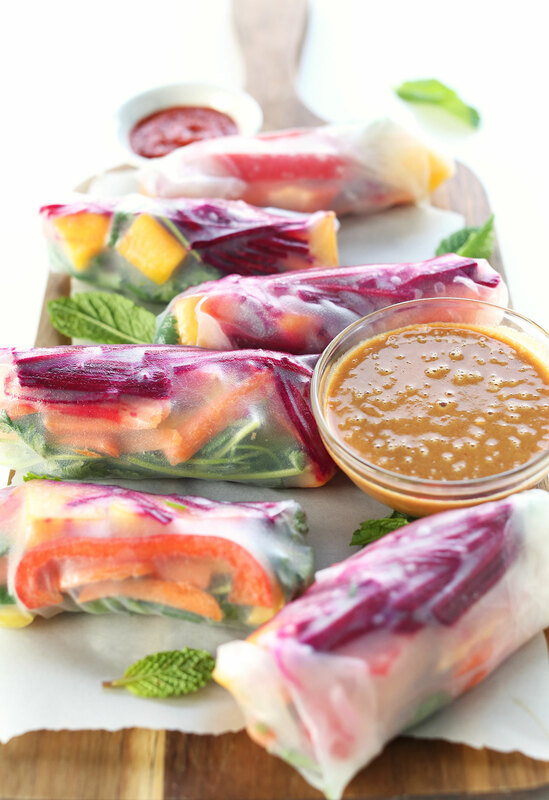 For instance, these 30-minute, nutrient-packed rainbow spring rolls. Care to join? So much goodness in one wrap. And we haven’t even gotten to the dipping sauce yet. The filling is cool and all, but can we talk about my love for peanut sauce? Spring rolls are just spring rolls, but peanut sauce elevates them to amazing. They’re just naked without it. For some extra kick, I added some fresh grated ginger – a throw back to my Asian noodle bowl – and the result is a perfectly salty-sweet sauce with some zing. I’m in love. These make a delicious light lunch or dinner and leftovers save well for the next day – just see my note about the mango! I hope you guys love these. If you do give them a try, let us know! Leave a comment or tag an Instagram #minimalistbaker so we can see. Cheers! 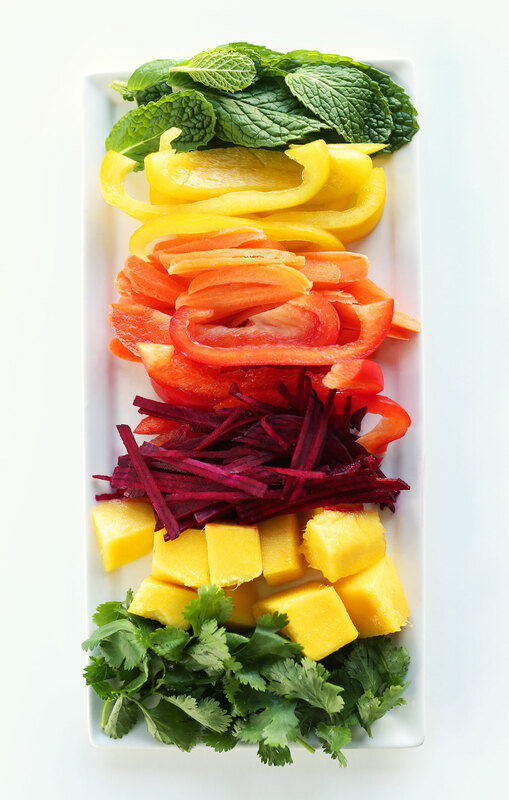 30-minute spring rolls filled with a rainbow assortment of fruit, vegetables and fresh herbs. So fresh, crisp and served with a spicy-sweet ginger peanut sauce! A satisfying, quick and healthy meal. Prep veggies and set aside for easy assembly. For the beet, I used this mandolin. You can find all of our Simple Kitchen Essentials here. Bring 3 cups water to a boil in a saucepan or kettle and set aside to cool slightly for cooking rice papers. Prepare peanut sauce by adding all ingredients except water to a mixing bowl and whisking. Add hot water 1 Tbsp at a time and whisk until desired consistency is achieved (should be pourable but thick). Set aside. Add hot water to a large shallow dish (I used a skillet) and submerge a rice paper to soften for about 10-20 seconds. If you let it go too long or if your water is too hot, they will get too fragile to work with. Once soft, transfer to a clean, slightly damp surface (I prefer a wooden cutting board), and gently smooth out into a circle. 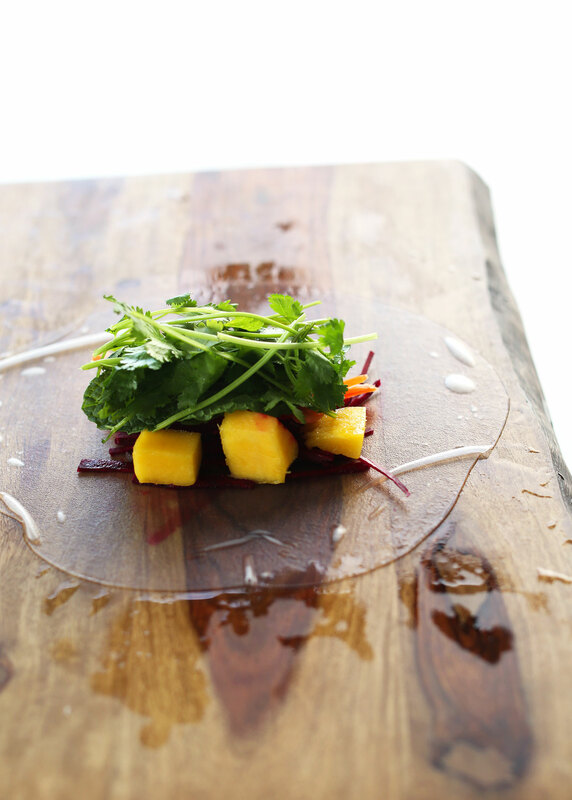 Add carrots, peppers, mango, beets, and a healthy handful each cilantro and mint (and any other desired fillings). Fold bottom over the fillings, then gently roll over once and fold in the side to seal, then roll until completely sealed. Place on a serving plate and top with a room temperature damp towel to keep fresh. Repeat process until all toppings are used - about 7 or 8 (amount as original recipe is written // adjust if altering batch size). Serve with dipping sauce and sriracha, if desired. 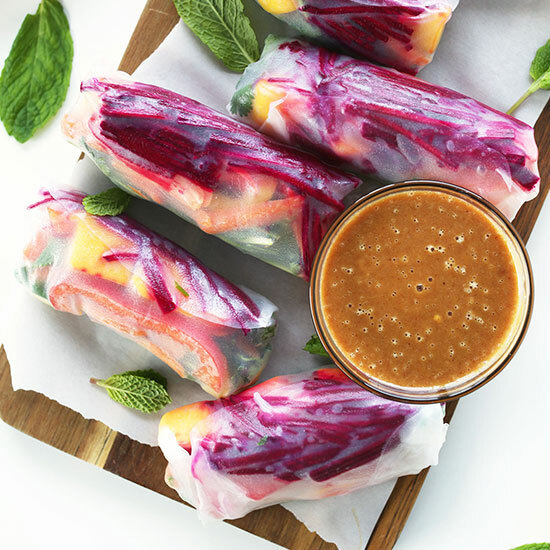 *I added mango in my spring rolls, and while delicious, I found that their acidity ate through the rice paper lining overnight! So if you’re making these in advance, leave out the mango, yo! *Nutrition information is a rough estimate calculated with dipping sauce and NO added protein sources (tofu, quinoa, or otherwise). We made these tonight and they were delicious! The kids helped and we all approve. :) We used avocado instead of mango because that’s what we had on hand. So yummy! I made this as a tasty vegan lunch option for extended family who came to town. Everyone loved it, except my mom (she’s a tough sell). I almost substituted red cabbage for the beets, but I’m so glad I didn’t because I learned I really like raw beets! I learned a new recipe and added tasty veggie topping for all my future salads. Win win! I made these and loved them so much! I modified the filling based on what I had on hand and used red pepper, carrot shreds, baked tofu, cilantro, and purple cabbage. My daughter is trying to go sugar free so I added some dates instead of the sugar in the peanut sauce. So yummy, will definitely be making again! We haven’t tried them, but thanks for the suggestion! We have seen them at some health food stores. Is there a school safe alternative that can be used instead of peanut buter? HI Dave! Would another nut butter work perhaps? Sun butter or cashew butter? Oh my goodness, that sauce is soooo yummy!!! The only thing I added was a chopped fresh chili for extra heat. Thanks for this great recipe!!!! Yum! Great addition, Christine! Glad you enjoyed it! Lots of yummy crunch in these! I didn’t have mango on hand, so I thinly sliced and flash fried some tofu and cooked some vermicelli rice noodles to balance out the crunchiness. I also added thinly sliced green onions because I have an onion addiction. The peanut sauce is bomb. I like mine more on the salty side, so only added 1 tbs of maple syrup and made up the rest with warm water to keep it moving. Fast, easy, and beautiful rolls. Definitely will make again, and probably make ahead and bring to parties since they seem to keep well in the fridge. Love this recipe, especially the sauce. These always turn out so beautiful. It’s one of my go-to recipes. We don’t put mango in them (not sure why, we just haven’t), and add a bit of sriracha to the dipping sauce. Amazing and soooo pretty! Hi, I am making the spring rolls. After they are made they are very sticky to pick up. Any suggestions? Hi Carol! You might be soaking your rice paper for too long! Also, we recommend keeping your fingers moist when handling the rice paper. Hope this helps! One question about peanut sauce. What would you suggest to use instead of tamari or soy sauce? I am allergic to soy products. Hi Narumi! You could try coconut aminos! Any recommendations on a sub for chili garlic sauce? Hi Gina! You can substitute it for harissa sauce or you could add red pepper flakes but you won’t get the same flavor depth. I made this. I used jicama as an addition. I didn’t use any vermicelli rice noodles to quinoa, but would probably taste great with too. After I ate my first bite with the peanut sauce, I walked around my apartment saying on repeat, “OH MY GOD!” I was flabbergasted. These taste like real spring rolls! I’m not missing any proteins! The cilantro and mint are key to this recipe. That’s what makes them taste like an authentic spring roll! Knocked this out of the park lady! Thank you for sharing the recipe! I made these tonight and they were delicious. Only change I made was thinning the peanut sauce out with coconut milk…I could just eat the sauce with a spoon for supper ?? Wow, there is A LOT of bacteria in your dipping sauce!!! You should get a better picture without all of the bacteria metabolism going on (bubbles). It’s probably from sitting out for so long for the photos, but still. Wow. It could just be air bubbles from whisking the sauce together. I doubt she would take such a nice picture with rotten food in it. I made these tonight and they were absolutely amazing!! I made a few substitutions in the veges: I used red cabbage, carrots, avocado, cilantro, and yellow bell peppers and they were very yummy. This was my first try making spring rolls and it was much easier than I thought it would be. We LOVED the peanut sauce too–made it a little spicier for my hubby by adding more chili garlic sauce. I will definitely be making these again–will try other ingredients inside the wrap–maybe do one with fruit too. I’m not a big fan of raw beet (unless I’m juicing it) either so I too will sub with red cabbage! And avocado is just amazing in anything! I don’t care for beets either, but I didn’t taste the beets either! Dat sauce tho…..I want to eat it like soup! These are so beautiful, and the sauce is perfect! A tip I picked up in Vietnam while watching an expert make spring rolls — place a damp, (wrung out, not drippy) cotton cloth (like a smooth weave dish towel, or even a bandana) on a cutting board. Smooth it down so there are no wrinkles. Dip wrapper in water, does not have to be hot, just to wet it, it will still be a bit stiff. Place it on the cloth and smooth it down. By the time you have filled it, it will be ready to wrap. I used to have lots of problems with the delicate rice paper tearing, but this method is fool proof and works every time. I made this for dinner tonight and it was so good. I altered the fillings for the rolls a little bit though because my girlfriend can’t have raw carrots, beers, or mangos. I put cucumber, yellow bell pepper, thinly sliced baby bok choy, rice noodles, chicken, mint, and cilantro. I served it with the peanut sauce, which was amazing, and some sambas oelek chili paste for a little spice. I also made some roasted brussel sprouts with a plum sauce. Excellent meal. I will definitely make it again. Thank you! I just made them. They are fantastic! Can I prepare the sauce in advance? Hi Dana! First off, I love everything you do! Do you happen to have the calories for the dipping sauce by itself? Thanks! Hi Tara! I don’t, sorry! But you can always utilize caloriecount.com for guestimates. I made these tonight for the first time. Used golden beets and shredded them a bit more than you show. Used a spiced peanut butter and garlic powder and omitted the chili garlic sauce. Absolutely delicious!!!! I can’t wait to make them again. Thanks you!! It took me a while but so glad i got to the actual recipe! It came through as a suggestion on Pinterest, then I clicked that and another two links and voila! They are so beautiful! Two questions…I have ginger/chili dipping sauce. I’m sure that can be substituted since I’m allergic to nuts? Also where can I buy rice paper? I called Whole Foods but they said to try an Asian supermarket… There aren’t any by me. Any suggestions? Hi Denise! Your sauce swap is fine. I buy my spring roll papers at World Market! In the past making spring rolls I have always found them to be too loose…..could you share some tips on how to roll them up tightly so they are easy to eat out of hand without the contents falling out? Dana, these were awesome. Mine certainly weren’t as pretty as yours, but they were light and delicious! I forgot to get carrots so mine certainly could be crunchier but the peppers and beets provided adequate crunch. I didn’t know you could eat beets raw!!! Thanks for all your hard work getting these recipes up. I’ve been vegetarian since May of last year and you’ve certainly made it easier, healthier and TASTIER than it would be without you! Keep up the great work because you’re improving many people’s lives and tummies!!! Beautiful pictures and I’m sure they’ll taste great, although I’m not sure as I’ve fainted from hunger as these are NOT a 30 minute recipe without all the fancy cutting implements. If you’ve got a plain ol’ knife like me and you’re not a knife whiz like me, these will take MUCH longer than 30 minutes!! All that cutting and cubing and thinly slicing took FOREVER. It’s a shame because it looks like it would be a great recipe but I don’t have time for hours of prep! 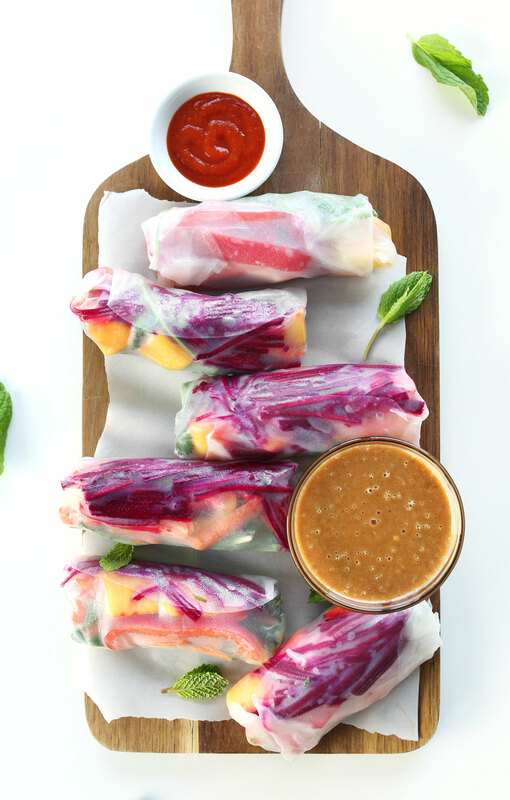 These rainbow spring rolls are as beautiful as they are delicious. My only modification on this recipe was I left out the beets (just didn’t have the time to prep these little babies). Also I used my potato peeler on the mango to form nice, uniform slices and my cheese shredder on the carrot. Our guest rated it her favorite dish yet (even said she would’ve paid money for it… beyond restaurant quality!) The peanut sauce was superb and SO easy. I will never buy prepared peanut sauce again. Thank you!! Made these tonight!! Perfect for dinner on a hot summer night, and absolutely delish. Ta Dana! I made them awhile ago for a pot-luck. The only down side was they took way longer to make then I thought they would and they got stuck together in the tubberware. But, practice makes perfect, I will try again. I was skeptical about the mango but it really added to them. They were a hit at the party! A small typo in the list of ingredients: ” 1 lunch bunch of mint….” Just wanted to let you know. Definitely going to try out this recipe. I’ve been on a major spring roll kick lately! Okay umm.. These were AMAZING!! I had never worked with rice papers before- thank you for teaching me how! I just used whatever veggies I had in my fridge for these & they were delish! The peanut sauce was to die for. We used the leftover sauce to pour over noodles with broccoli, garlic, etc for a nice peanut Thai dish. Totally non vegan boyfriend approved! Thanks MB- yall are my faves!! dumb question: what is chili garlic sauce? Do you buy it? Where? Or just make it? Thanks this looks amazing! Not a dumb question! It’s a blend of peppers and garlic and you’ll usually find it in the Asian section. Clear container, bright red sauce and bright green lid! I get mine in Asian sections at the grocery store + World Market! Also, obviously Asian markets. These look absolutely beautiful! I’m planning on making them for a spring dinner party, but one of my guests is allergic to peanuts. Any suggestions for an alternative sauce I can make for him? This sauce is insane! Thanks for sharing the recipe. I now make it all the time with whatever produce I find in the market :) Just need to work on my rolling skills. These look absolutely amazing, and I am definitely going to make them sometime soon! Just made these tonight…soooo good, and the peanut sauce totally takes them to the next level. So wonderful! Thanks for sharing and thanks to your friend for mentioning us! Much love. I am so excited to try these! Is there any sub you could recommend for the chili garlic sauce? I can’t find the stuff anywhere where I live (it’s not a very cultural place) and I am a complete cooking noob and wouldn’t have a clue what to use instead. Made 3 of these rolls and the peanut sauce for lunch tomorrow. Delish!!! Omg this peanut sauce is so rich and flavorful. i may have licked the bowl clean. Love the rainbow colors too! Yay! So kind! Thanks for sharing, Sherrita! Made these for company a few days ago. Very pretty and satisfying. I addeda sweet chili sauce and some hot sauce to the dipping sauce which is very mild – wanted to kick it up a notch or two. The fresh mint and cilantro work well together. Omg can I say that I am soooooo happy that I found your page. My friend made your vegan nacho recipe and posted a picture on FB. It looked absolutely amazing and I begged her to send me the link. I was so excited about making the nachos. The next day I decided to do a google search for black bean enchiladas and your site and recipe came up again! I then looked around your site more and found this amazing recipe for spring rolls. I have been looking for easy vegetarian/vegan spring roll recipe. Long story short I couldn’t have found your site at the perfect time as I am transitioning to a vegetarian lifestyle. Thank you soooooo much for making all these amazing recipes and sharing them with us. I cannot wait to try them. I was beginning to get so discouraged on my new journey because I didn’t know what I could make with my crazy grad school schedule besides salads most of the time. I love how easy and quick your recipes are! I keep rambling but I am so excited about your site! Ah, thanks Destiny!! So glad you’ve found some encouragement / inspiration here! Hope you love the recipes and thanks for following along! Great food. I love simple. I’m going to make them! In your preamble, you also asked for resolutions… My practice, for many years, on New Years eve, is to list the good and happy things that have occurred during the year, and my achievements. Perfect set up for more good things to happen! Love it! Thanks for sharing, Veeko! i buy these from Whole Foods waaaaaaaay too much lol! yall make them look so easy to prepare at home. will give working with spring roll paper my best shot. thanks for the gorgeous inspiration. yummy! My son has a birthday in the spring so I may make these beauties for his party! first time i made a version of the peanut sauce i accidentally used tamarind instead of tamari and it was still delicious! Had anyone tried it? I bet these are delicious as they are beautiful. 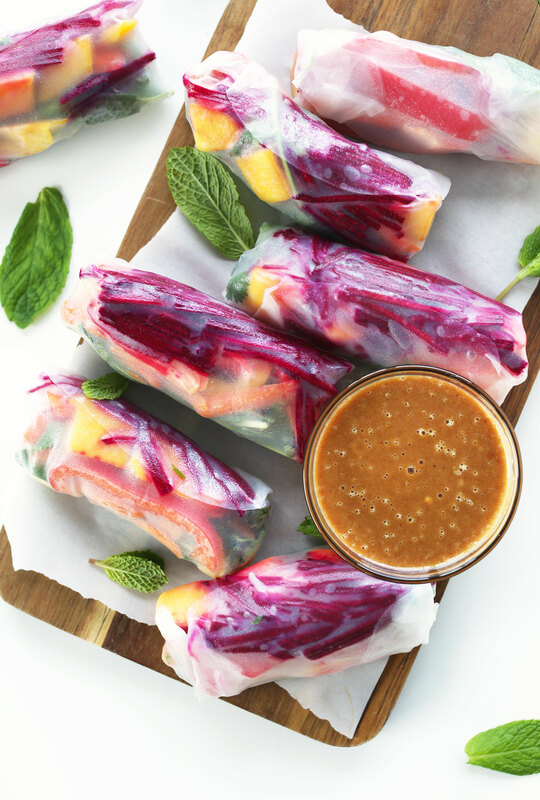 Love the veggie fruit/combination you chose these spring rolls! Does your nutrition information include tofu, quinoa, or vermicelli, or none? Looks great – I’ve always been intimidated by rice paper wrappers, but this might just make me do it! It includes none. I’ll add that to my notes! Wow, Dana, you certainly have a talent for combining such beautiful colours in your recipes! Impressed much? YES! I bet the recipe tastes as stunning as it looks. I love how colourful these are – a perfect way to brighten up the dreary wintertime! Never thought to add thinly sliced beers before! Such good colour, so adding beets from now on. These look so lovely and fresh. Beautiful colours! Oh wow – that sauce!! These rolls are gorgeous. Bring on the colour! Mmmm – these look amazing and so bright! Spring rolls are a go-to easy weeknight dinner for me, but they’re nothing without a tasty dipping sauce and that one looks amazing! Agreed! The dipping sauce makes it. Hope you give these a try, Jess! I love fresh spring rolls, but I’ve never tried adding mango to mine. I bet it adds such a nice fresh sweetness! These look great! I love all of the color. It’s been a little cold and dreary lately so bright food is what is in order. This sounds like a delicious recipe – it would work really as a lunch for work. It is super healthy, easy to transport too. I would love to join if I was in Portland!! These rolls look radiant! I love all the colors and the whole sweet + savory combination of flavors! These look delicious, you make everything look very easy! Ooooh these are so colourful and look delicious! Pinned! Oh my GOSH! I LOVE your photos on this post! this looks delightful and yummy. thanks for posting! YESSSSSSS i feel like we are palate twins and that you make every single recipe just for me because literally everything you post is like all my favorite stuff put together. This looks so yummy and the different colours make it really look a rainbow indeed! I loved your vietnamese Todu Spring Roll recipe (made it 3 times already), so I am excited to try out this one as well. I pinned it and will make sure to try it out next time I am craving spring rolls, I still have some spring roll dough in the fridge! Ooh, those are probably my favorites. Glad you’ve already tried them! Oh my giddy aunt. These look DIVINE. DO IT. Hope you love these, friend! 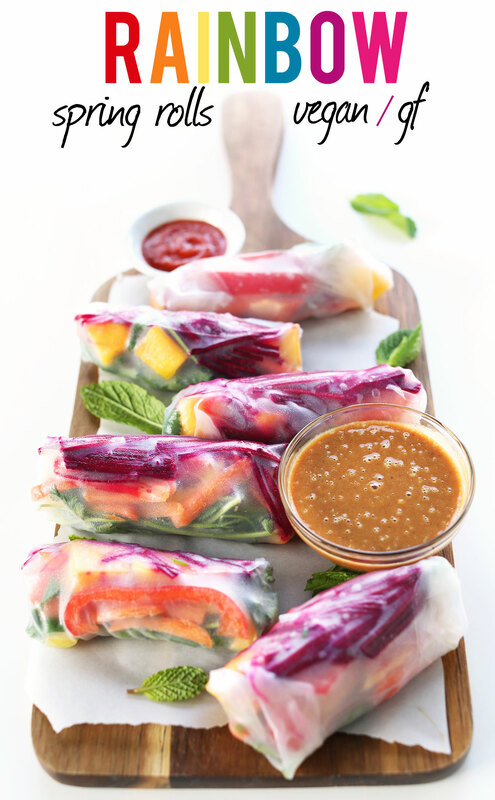 I love spring rolls and these looks like they belong on my healthy eats list for 2015. Your recipe came over on my Bloglovin feed and I’d love it if you would share it at my Tuesday link party, Tickle My Tastebuds . They sound delicious and they look so pretty! I’ll definitely be giving them a try as I’ve been trying to eat healthier this new year (cliche much!) p.s I’ve loved all of your recipes that I’ve tried so far! Ah, thanks Divya! Glad you’ve been enjoying them. Hope you love these! These fresh rolls sound delightful! At first I thought the beets were chard stem and I got all excited. What can I say — chard is awesome. :) But beet works too, and probably better as a raw ingredient! Chard is so beautiful! Good guess! And yes, it would be totally delicious in these rolls as well. Oh, YUMMMM! Question for you guys– where do you buy your spring roll papers? These are beautiful! I’m so excited to try these, just curious, did you use vermicelli noodles or tofu in your versions? Just wanted to know for nutritional counts sake. Thank you! I left mine plain! But really either would work well. Rice paper wraps are my favorite! They’re so good – and I always feel full after but not too full, you know? This looks like a delicious and vibrant recipe! Totally get ya. Love that satisfied but not stuffed feeling! Also, (completely unrelated) I’m heading to Portland in May for the first time so if you have any recommendations for good places to eat, please let me know! This look so fresh and pretty! And oh. My. Goodness. That sauce? I need to make these ASAP! dat sauce. I would bathe in it if I could. Hope you love these, Danielle! I absolutely love this! All of those vibrant colors just make you want to eat this. And the combination with the peanut sauce makes it even more perfect. Thanks Emily! Hope you love these! You can buy chili garlic sauce in most international food sections of your grocery! It is a staple at my house! This recipe is a fun thing to do when you have people over: put the prepared filling components in the middle of the table, with a few spots to for hot water to soften the rice paper wraps. Dana, I’ve made these several times, and just came back to check the recipe. Thanks!